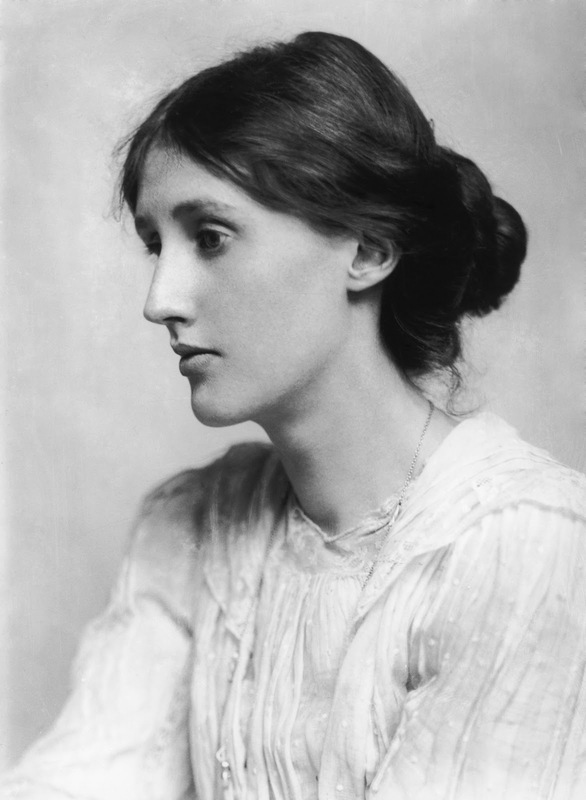 Virginia Woolf as a young woman. I keep a copy of this portrait on my desk. So I spent Monday in London, escorted by my wonderful fangrrrl niece Amelia, at the ‘Virginia Woolf: Art, Life and Vision’ exhibition at the National Portrait Gallery. And it was wonderful. We saw innumerable portraits and photographs, but I think the personal papers were the most moving. There were pages from her diary describing the bombing of Leonard and Virginia Woolf’s Tavistock Square home in October 1940, the original manuscript of ‘A Room of One’s Own’, love letters from Leonard written before their marriage, and most moving of all, the little note she left for him when she set out to drown herself in the River Ouse in 1941. One of the things that particularly struck me was that Woolf bound all her own notebooks and manuscripts, having taken bookbinding lessons in her teenage years as some kind of therapy for her mental illness. The result was that she could make the perfect notebook for her own needs – which is, for a stationery addict like me, absolute nirvana. Her books are big, too, slightly larger than A4, leaving plenty of space for her to explore her ideas. Another interesting detail for me was that the page from her diary about the bombing had no crossings out on it at all. My diary is a veritable Somme of scribblings-out, but she wrote a stream of consciousness with a self-assurance that seems absolute. She had no doubts about what she was trying to convey. The original copies of her books, published by the Hogarth Press, which she ran with her husband, still with their book jackets designed by her sister Vanessa Bell, look crisp and radical even now. Amelia (a bookseller) and I both commented on the fact that the many editions of the novels for sale in the gallery shop had an assortment of different covers, none of which were so attractive, expressive, and frankly Modern-looking, as the originals. Woolf is my writing hero for so many reasons. She battled mental and physical illness, misogyny, and childhood sexual abuse to become one of the greatest novelists of the 20th century, reinventing the novel form in a way that would be emulated and built upon in succeeding decades. She was self-educated, too, and could read Greek and Latin, despite the fact that her parents refused to send her to school as they did her brothers, a fact she railed against. She is often criticised for being classist and racist, but I would argue that she was a product of her time, and it is to her credit that she did so much to counteract the snobbery and distrust of the working classes, which she inherited from her social millieu, through her political work. Virginia Woolf was a great writer and feminist, a patron of the visual and applied arts, and a creative giant, as well as a truly great human being who overcame enormous adversity to achieve what she did. If you cannot get on with her novels, I wouldn’t judge you, but I urge you to dip into her enlightening and often witty diaries for inspiration on how to live a creative life despite so many difficulties. This entry was posted in A Room of One's Own, creativity heals, Diaries, Famous Diarists, Heroes, illness, Inspiration, My Life, Notebook, Notebooking, reading, Virginia Woolf, Writing and tagged A Room of One's Own, art, Bloomsbury, creativity heals, Exhibition, Leonard Woolf, National Portrait Gallery, Virginia Woolf, Writing on 08.10.14 by evenlode1967.